One two, one two... Is this thing on? …a little slower! When dealing with technological changes, in most organisations which are relatively small or on which the organisation’s whole business model is predicated on the technology for service delivery it’s relatively easy for them to quickly embrace change and innovation and incorporate it into the business. But in local government, whilst its easy for webteams who live and breath internet technology as part of their working days to get excited about emerging technologies, inevitably the transport planners, the road safety officers, the social workers, the swimming pool lifeguards, the bin collectors, and the parks attendants who deliver the overwhelming majority of council services will by and large take a bit longer to get excited. Technological change is easy – culture change not so easy. “There will come a time when for some councils, they won’t have a council website – for most of their service delivery, the website will be the council”. When the term Web 2.0 was coined, most people in the marketing world took it to mean blogs and other social media – ie, the addition of interactivity and the ability for people to add their own comments to web pages. This was a fundamental misinterpretation of the term, because if truth be told the inclusion of user generated content such as guestbooks, forums, and polls arrived on the web fairly quickly – what it actually meant was the ability to share online components from site to site, usually by means of embedding content from one site to another, eg embedding a Google map in a site, or more stylishly by using Google maps or Open Street Map to make your own map (of eg neighbourhood offices, grit bins, or cycle stands, etc) to embed on a page. The Next Big Thing in Web 2.0 is Open Data – this is not just about the council putting its expenditure over £500 online so the engaged citizen can see how much was spent on a new carpet, it’s about the publishing of datasets in formats which can be interrogated programmatically, so for example an external agency can produce a graph showing trends, or so they can build an online tool which can do something useful with the data; we’ve already discussed the idea of presenting the website as xml so that external agencies can make their own customised versions of the website for niche audiences, another idea could be one whereby an agency could take housing data (empty properties, number of bedrooms, location, rate of churn, etc) and schools data (number of free places in each year, location, etc) and make an online tool for people to select housing locations based on school availability for their children – eg, people affected by the spare room subsidy needing to downsize and looking for mutual exchange. Up to now mobile has just been seen as delivering cut-down content for the benefit of people with small phone screens. We need to ensure we’re thinking beyond that when it comes to researching and delivering the added value benefits of mobile take-up – we need to recognise the different facets of what defines mobile (using your phone on the bus, using your phone in bed when you’ve just woken up and want to check something whilst it occurs to you, using your phone in a location to gain extra information about the location or carry out an activity at the location, using your tablet on the sofa rather than walking over to where your home computer is, etc), anticipate them, and stimulate demand and innovation. In terms of mobile tasks, we need to accept some tasks can’t be completed on a mobile device, but they can at least be started – so for example a citizen sees a planning application notice on a shop window, they log it in their phone, but the fact of them having logged it in their phone persists so when they get to their proper computer it’s there ready for them to pick up and read the details of. And, of course, we need to learn how to make mobile apps ourselves rather than rely on suppliers. This is something which is being talked about a lot by Tim Berners-Lee. Since he’s the chap who invented the world wide web, he should know what he’s talking about. What TIoT is is the idea that ‘things’ have web addresses, and report their statuses or allow people to interact with them – so in the council context, street lamps, parking ticket machines, traffic lights, street signs, park benches, bins, etc have their own individual urls, so when we ask people to report a faulty street lamp they can see the url for that lamp, enter it into their phone (whether by our friend the outdated QR code or not…), and that gets logged directly into the system for repair. Or planning / licensing applications have their own urls which are displayed on the poster, so people can go straight to them to find out what the plans are. Lichfield District Council started to do some work in this area. The term responsive design originally comes from architecture, and refers to the ability of something to react to the environment around it – the way the lights in modern buildings turn on and off by themselves are examples of responsive design in architecture, or rotating blinds on windows which automatically open and close according to whether the sun is shining directly on them. Responsive Design on the web up to now has just been taken to mean the way a website automatically changes its layout in reaction to the screen size, principally according to whether or not the user is accessing it with a phone, a tablet, or a computer; so far as screen size responsiveness is concerned is designers defining a default screen size, and changing the design as the user’s screen gets smaller. Our main site has had an implementation of this kind of responsive design for a few years now, and the layout of the Birmingham Alpha site was built using a responsive framework called Skeleton, so we can take for granted we shall continue to work in that direction. What we’ve all been missing so far is what happens as people have bigger screens – or more accurately, wider but shallower screens, as many modern laptops have – we need to change layouts in the expanding direction as well as the shrinking direction. But responsive design shouldn’t just be about screen sizes – there’s a demo of a proof-of-concept somebody did which used the user’s camera function to detect how far away from the screen the user’s head is, and make the text bigger or smaller accordingly as responsive typography. 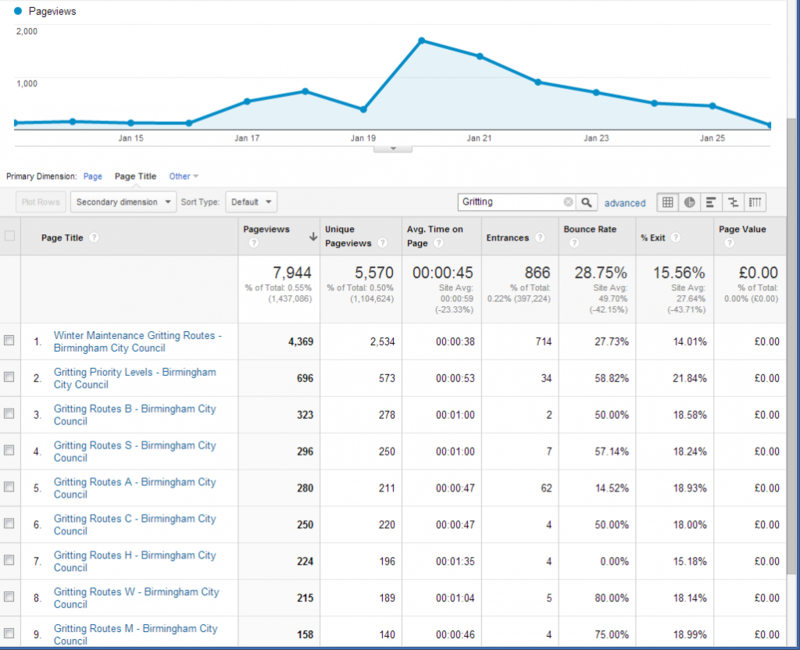 Another example of responsiveness – suggested by Adrian Short in July 2012 – is the site / home page delivering different content according to the time of day – ‘morning’ related content in the morning, ‘night-time’ related content after 5pm, relevant personalised content if the customer has an online account (eg, it telling them on their bin day to remind them to put their bins out, and afterwards explicitly asking them if their bins were collected). Or delivering different content automatically according to location. When we did the original pilot of the history of canals in Birmingham, ebook ownership was still quite niche. Now it’s mainstream – sitting on the train in the morning, I see lots of people reading using some form of ereading device, whether that’s one of the varieties of Kindle or an iPad or Android tablet; in fact, I’d say the reading of paper books on the train is not just a minority, it’s a rarity. In June 2011 I wrote an article speculating on the possibilities of using specifically the Kindle’s automatic updating features for online service delivery – it’s an area which is still waiting to be tapped by people who have the time and creativity to do some in depth research. The ultimate examples of crowdsourced content are Wikipedia and Open Street Map. But as councils we could also crowdsource some of our own content – eg, the people who use the country parks, the leisure centres, the libraries might know more about what’s going on in them than the people who maintain the web pages for them; moderated crowdsourced content would both build reputation and improve engagement, boosting channel shift. Related to both The Internet of Things and Responsive Design, providing actual real time information through the site to enable customers to make decisions – eg, current waiting times at the household recycling centres, or even webcam views of the queue outside the household recycling centres, number of free parking spaces at various car parks, or webcam views from the main arterial routes into the city. Some of this information actually exists and is updated in real time anyway – eg, some car parks already have the signs which say how many free spaces there currently are in the car park, so there shouldn’t be much of a leap to connect that information to the website itself – all that’s required are the APIs to connect them together. So it would be interesting to see how much of this kind of thing gains traction – on our own website and on other council websites – over the next year or two. I seem to spend an awful lot of time looking for stuff on my local Council’s web site which I know I’m not going to find. For example planning applications – just actually finding them & supporting papers is always a nightmare, as is finding any historic committee paperwork like that – and I know I’m not the only one looking for such stuff. Just now I was looking for an Equalities Impact Assessment for a current event and there’s bugger all – especially as CoYC rename them as Community Impact Assessments. For transparency we need the data, and the data needs to be accessible (in all senses). Bugger the flashy technologies – get the basics right! Those examples you cite there I think are classic cases which the auto-updating feature of the Kindle format could be used for – citizens interested in planning applications, licensing applications, or council meeting minutes and agendas if they had those ebooks on their kindle devices could receive the documents to them automatically, as another option to choose from if they prefer it. What would also be good would be if the web CMS could automatically create ebooks from collections of pages; since the .mobi and .epub formats are open formats which are underpinned by html, and since it’s quite easy to programmatically generate .rtf and .pdf files, I assume it will be similarly easy to generate ebook format files. Some really awesome ideas in here Simon, especially revolving around Open Data and ‘The Internet of Things’ – both of which I think are massively under–discussed not only in local government but amongst the web as a whole. Imagining an API–first approach to city–wide enhancements (street/traffic lights, bin collections, the true day–to–day concerns) opens up, quite literally, a world of possibilities. Updates – Phil Rumens has written more about the Internet of Things idea on The Internet of Broken Things, and CMS vendor Jadu have come up with a proof of concept of CMS-generate eBooks. We love gritting in local government communications – it’s the nearest we get to taking part in the excitement of 24 hour rolling news coverage; eyes are constantly tuned to the Met Office hourly forecast to see what the temperature’s doing, ready to push out to the Twitter Gritters the notice that the wagons are going out to treat the roads. And most council websites naturally have a prominent link to the gritting information on the home page, because it’s important, and therefore popular, isn’t it? Like most councils, ever since I remember we’ve every winter put a link to our gritting information on the home page, and for the last couple of years since we’ve had the current version of the home page, in the ‘most important’ popular pages section (our place for top tasks) in the left hand third of the upper half of the page. Last year we had an extended winter, and the profile of the gritting service was quite high in both the traditional and new media. So on that basis, we’d expect that the access statistics for the site would show high usage of those pages. In actuality, that was completely not the case. OK, so we had a long winter but it wasn’t snowing and freezing the whole time – there were two peak periods, at the end of January and again at the end of March, when the gritting pages received particular attention. 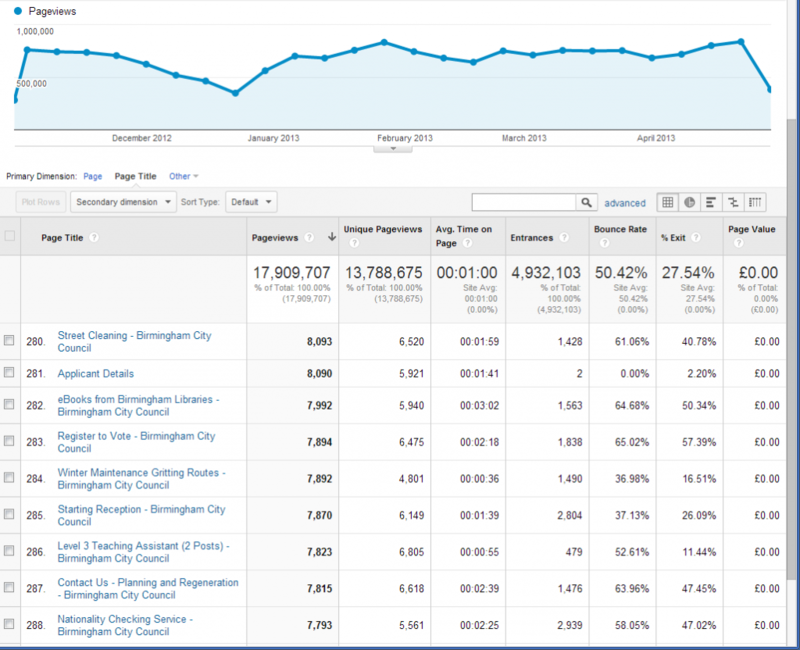 So on the basis of using statistics to drive placement in the key popular pages area, for this year gritting routes just won’t get a look in – primary school admissions, swimming pools (even uniquely on its own the Stechford Cascades page), the register office, and the Brasshouse Language Centre all can evidence higher claims to that important piece of screen real estate. But all is not lost for fans of true grit – whilst the popular pages section is driven almost entirely by statistics, in the area of the lower half of the page we call the connecting wall we have more scope for the inclusion of links we deem to be important even if interest isn’t particularly high. So instead this year we’ve made the decision that during winter fewer people will be particularly looking for information about dropped kerbs (last year during the period being measured totalling 9,581 of the pageviews), so we’ve replaced that link in the bottom right transport box of the connecting wall with a link to the main gritting and winter maintenance page. Eagle-eyed readers may have also noticed something else from the statistics screenshotted in this article about the shape of our access statistics which has implications for how we use statistics for planning the direction of the website – more on that in a future post! Great article Simon, really interesting. Our approach on our home page is to add to link to a winter updates page that contains latest information and links to bus timetable changes, schools closures, office closures, road closures, gritting etc. This information is amongst the most time sensitive on our website and the link is often only on the homepage for 2-3 weeks during the entire winter period. The link is added when we receive a weather warning and is removed once analytics shows it is no longer one of the most popular pages. It is interesting that during January and February 2013, our salting and gritting routes page received 50% of its visits in 3 days and one week is responsible for 75% of visits for the two months. Recognising the irrelevance of this information for most of the winter and monitoring the demand is key in meeting the needs of website users. It is possible to do even better than that. We could monitor hourly trends to make home page links even more relevant. Analytics shows us that winter information is often accessed at specific times of day. Taking the most popular day for winter travel info – Monday 21 January, 84% of visits were before 2pm. If we want to remove a link when it is no longer popular, then with better monitoring we can be even more specific and identify the moment content is no longer popular. We of course have our own ideas about what makes a council website usable – and part of the point of sharing the work in progress of this project here is to test if our ideas are shared by our citizens and our industry peers. But it’s always best practice not just to rely on one’s own generalist expertise and one’s own individual consultation work, but to also engage the advice of independent specialist experts, to either verify your own findings or alternatively shed light on where your own proximity to a project might be skewing the results in favour of what you might want them to be – this process is sometimes known as red teaming. To that end, we commissioned some independent usability experts from AbilityNet to do some work on our behalf – a quantitative benchmarking exercise of a number of other council websites, and a qualitative focus group exercise looking at our current website together with our plans for the next one. Find where a leisure centre close to me is. The reviewer was able to complete all 10 of the benchmark tasks for seven out of the eight councils; for the eighth council he gave up on four of the tasks, including core tasks like finding school term dates; the total time to complete the tasks for six of the eight councils ranged between 203 seconds and 228 seconds, with the seventh council taking 310 seconds and the eight council 635 seconds – average times per successful task were 20-23 seconds, 31 seconds, and 37 seconds. The reviewer was able to take all the metrics together and rank the eight sites in order of measured usability – there were no surprises which ones took the 1, 2, 3, and 4 positions – first was a council which has spent a lot of time over the last year or so carrying out in-depth open public consultation on its website development, second was the council which many have seen as setting the current trend for an alternative navigation paradigm, third was a site which had a new design launched earlier this year and was generally well received, and fourth was a site very much based on elements taken from the second and third placed sites. What was surprising was that the site placed seventh was one which has consistently been a Socitm four star site three years in a row. With more complex tasks the initial action needed to be taken to be clear. Highly niche content given pride of place on the home page. An important point made in the consultant’s summary was that having a large amount of information and links is not automatically a usability barrier per se, if that content is clearly grouped, well spaced in a clear font, and not too dense. And also, don’t make the common tasks easy to perform at the expense of making the complex tasks difficult. For the qualitative analysis aspect of the work we commissioned, two focus group sessions were held – one comprising a mix of students, council tenants, pensioners, and part-time retail workers, the other consisting of automotive sector employees, small business owners, property developers, creative sector business owners, food sector employees, and graduate public sector employees. All participants described themselves as confident using computers and the internet, lifelong residents of Birmingham, having a reasonable level of engagement with the council, and would generally prefer to use the council website over phoning us up, even though they might resent having to do so. The residents-oriented focus group had an age range of 45-67 with one 18 year old, and the business-oriented group had an age range of 37-58. At the start of each of the two sessions the participants discussed some of the other websites they use on a regular basis – unsurprisingly, Google came high on the list, to the extent that there’s almost a perception developing of Google search results being the actual information some people are looking for, rather than gateways to the information. Other websites cited by the participants as being favourites were MSN, John Lewis, Next, Ikea, and Amazon; websites cited as difficult to use were H&M and Argos. Participants also pointed out how difficult pop-up / drop-down menus are to use on a touchscreen device – looking at the trend towards touchscreen even in the home, that’s something to be particularly aware of. As well as our existing and this website, the groups were also showed some of the websites the consultant looked at for the quantitative benchmarking exercise; features overall participants liked were bold and meaningful icons, clear and simple link labels, simple navigation, a modern look, good use of images, ‘most popular’ sections, and positive use of language. Features criticised were unappealing colours, noisy appearance, too much text, link text wrapping over two lines, a lack of identity making a site look generic, boring design, unclear icons, distracting background images, and poor navigation. Of the residents-oriented focus group, only one participant actually indicated that they got frustrated if they didn’t find the information they were looking for within two minutes – the rest agreed they had no problem spending time on a website so long as they did find the information, and one person made the point that they spend 30-60 minutes on a site to carry out a complex task such as booking a holiday. Most of the participants in the group said they used the council website for booking bulky waste collections, and were pleased with how easy that feature is – this actually tallies in with out own evidence from our complaints and compliments system, where the overwhelming majority of people who are motivated to send us a compliment about the website do so in relation to booking a bulky waste collection! Participants also, unsurprisingly, use the website for searching for information and for using the forms to report streetscene problems, although there was some disgruntlement about having to register for an online account for some forms. When asked what they liked about our current website, all of them strongly agreed about the feature we currently have on the home page which we call the Connecting Wall; they commented that most of the information they are likely to need can be reached from there, that they tend to look there first if they’re coming in via the home page, and they like the fact that they’re not waiting for a pop-up menu to appear. They also like the news panel on the existing home page – this tallies with other information we’ve seen that whilst industry thinking has it that most users aren’t interested in council press releases, anecdotally we hear that actually the presence of ‘news’ on the home page – by nature updated weekly or even daily – is something that users appreciate because it gives them confidence of the currency of the site as a whole. What they especially didn’t like was two sets of moving content on the home page, especially the movement in two different directions. Reflecting what we’ve already discussed and found in the past, opinion was divided about the use of images on the home page – some want them, some people don’t, some people think the current design is boring, and others don’t think a council website needs to be jazzed up – though of course the design of the website needs to account for the fact that it is representing Birmingham to the outside world. Looking at the proposed new site, disappointment was expressed that the Connecting Wall had been removed from the iteration of the home page that was in effect at the time the focus groups were held. On the boxes on the top level main pages containing links, the participants made the comment that the lists should be in alphabetical order – holding my hands up here, that was my fault as at the time of creating those boxes the content was actually hurriedly copied and pasted and I hadn’t had chance to alphabetise it, but it’s good to have definite feedback on something we already know to be true! When talked through the five new major top levels, participants correctly deduced the kind of information which is expected to be under each, though they were strongly of the opinion that the transport and travel section – under About the city at the time – should have its home under Residents. When asked where they might expect to find four specific pieces of information, they only guessed one correctly – so we know that whilst the broad principle of the five top levels works, we also know about the extra work on the detail we must do. As with the residents-oriented group, participants in this group mostly use the website for rubbish-related activity; generally they all said they could find information they were looking for, but not always particularly quickly. They also all agreed that they would be unlikely to use the general mobile app we’ve released. Only one participant specifically referred to their professional / business reasons for using the website. Looking at the current website, like the residents-oriented group, all the participants were in strong agreement about the value of the Connecting Wall on the home page, although beyond the home page there was some agreement that information can be hard to find where there is too much information – and links – presented at once. The point was also made that people don’t go to a council website as an entertainment, so design and navigation features need to reflect that. Turning to the proposed new site, there was overwhelming disappointment – comment was made about how drab the version at the time of workshop was, and that it appeared to be a papering over of the cracks rather than a complete rebuild exercise. Whilst we’re disappointed with this reaction, we’re not too troubled by it on the grounds that ultimately the new site will have a proper design rather than a functional design, and it’s possible they focussed on the content of the pages (which was just copied and pasted from existing pages) rather than the navigation. They did however make better guesses about what content would be found under what new top level, and like the residents group agreed that transport and travel should have its home under Residents rather than About the city. Whilst you ignore the results of citizen consultation and feedback events at your peril, if you know you are correct and the feedback is wrong, you should stick to your guns; just because a panel of residents thinks transport information should only be under the residents section of the website, that does not necessarily mean they're right. You can also read the full report and its terms of reference. Over the last week or two at work I've actually started being a little bit naughty. The webteam in Birmingham here, like many council webteams, sits within the Customer Services division of the council, rather than within either Corporate Communications or IT, like in many other councils. This means the word which underpins all the work we do is the word 'customer'. Being frank, I was never particularly happy about us being moved from comms to cs when it happened - as a person out on the street who buys things, my overwhelming experience and view of 'customer services' is they're the people you take a faulty product back to, who spend a lot of time trying to pursuade you it isn't faulty, or the people you complain about an intangible service to, who spend a lot of time telling you the majority of their customers think the service is just peachy. I, frankly, have never been happy about my job being associated with that sort of thing. I've also never really liked this description of our website users as customers, but it's only in the last few weeks or so I've been able to really crystalise why I've never really liked it. The first reason is one which I've shared a lot in many arenas, and which underpins a lot of my discomfort with a number of current council website trends - customer services divisions of councils seem to have quite a skewed view of who their customers are, focusing on the people who are complaining about potholes, missed bin collections, and leaky taps in their council houses. Those might be the biggest numbers of customers, but that shouldn't exclude the business customers (large and small), the visitor customers, and the politically-engaged customers - those other groups, because they don't register as big numbers in the statistics, it is often a struggle to get counted as also important. The second reason i realised more recently why I don't like the word is that actually, very few of any of these people are actually customers in the usual sense of the word - customers are people who have a choice, who can take their custom elsewhere if the initial provider doesn't live up to expectation. But for most services, council customers don't have a choice to go elsewhere - it's only councils who provide the service of fixing potholes, collecting bins, and fixing leaky taps in council houses; the customers are stuck with our service, whether we provide a good one or not. Not just that, customers are people who not only can choose who to have a service from, but they can also choose to have a service at all - but our customers have a right to these services of having their potholes fixed and their bins collected; by referring to them as customers, we're actually denigrating the fact that they have rights. And similarly, customers have the option to not choose a service - but council tax customers don't have an option to not pay their council tax! So a couple of weeks ago at work I started, clearly and pointedly, in all emails and spoken conversations, no longer referring to customers, and instead referring to citizens - citizenship is what we want to promote in our towns, boroughs, cities, and counties, citizens encompasses everybody ensuring groups don't get dismissed, and citizens to me emphasises the fact that they have rights to our service rather than being people who should be grateful for it. And specifically when it comes to web services, I've returned to what should never have been dropped in the first place - referring to web users as, well, users. Interestingly, not long after I first wrote this, internally the organisation did indeed start to replace the word 'customer' with the word 'citizen' in all its communications - I wonder if it was my effect that did it? When the person in front of you declares that they never use menus, that they only search, even their own personal description of their own behaviour can be suspect. All web users will have their default preferred strategies for navigating around a web site – but the point is different web users have different preferred strategies; some people will prefer to use a menu, some people prefer to start off with a search box, and some people will jump straight to the A-Z section, if one is present. It’s also the case that – whilst a casual user might lose patience and go elsewhere if their preferred method doesn’t work for them – a persistent user will fall back on one of the alternative methods available to them, especially if the alternatives are clearly visible. Sometimes the same user will have different strategies depending on their knowledge of what they’re looking for – an expert user might know exactly what to type into the search box to find ‘school term dates‘, but they might be hazier about what to type in to the search box order to find out where sites of archaeological interest are in the city – for this, a well-constructed menu structure will serve them better than the page author trying to anticipate all the possible combinations of search terms a user might conceive in order to shoehorn those search engine optimisation phrases into the text. And indeed since Google is reliant on contextual links on pages on a website in order to index it, a good menu structure backed up by sensible A-Z curation is essential for good SEO. Another reason why a site should always offer a well-constructed menu structure and A-Z index, rather than only relying on user search, is that as well as helping people find the information they want, they also inform people about what other related information they might be interested in – for example, landing on the tree preservation main page a user can see at a glance in the menu on the left other information related to the main topic, and indeed they can also see up a level a link to a whole raft of further related content around the topic of conservation – free information they would not have had if the site relied solely on search for navigation. We have already covered the importance of niche content both for external search engine optimisation and for user testing purposes – the subject of niche content is another area in which you will often hear people confidently state ‘nobody is interested in that’, when in fact it is just they who are not interested in that. In many cases, niche content – which by definition a relatively small number of people are interested in – is just the kind of content which our most civically engaged citizens are interested in, who in many cases represent a demographic highly likely to use a council website, and perhaps more importantly, tell other people about their experience of using it. The third area in which we often hear statements about what nobody does is scrolling – with the corollary that a design, especially a home page design, must fit into the user’s browser screen. 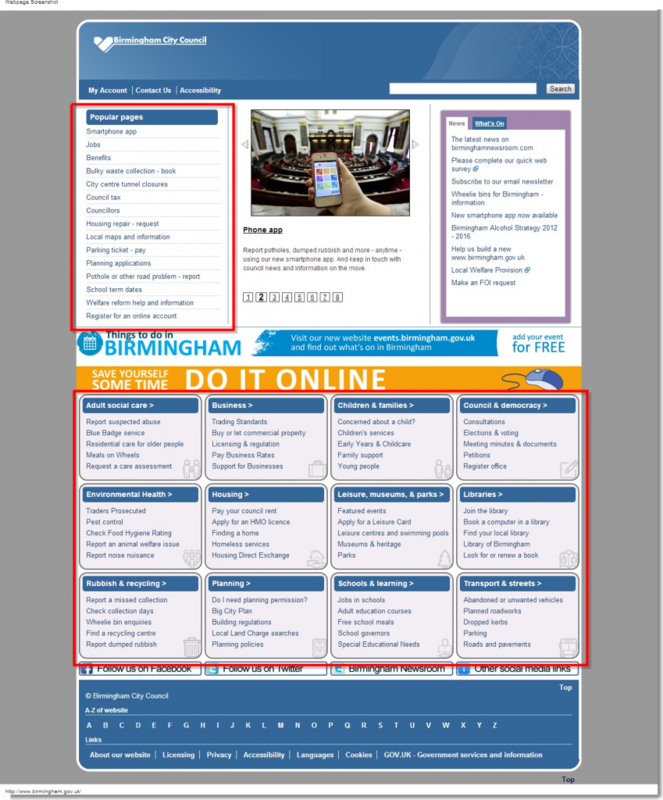 As it happens, the previous iteration of the home page of the Birmingham City Council website before the one in use at the time of writing this article was designed to fit neatly into a full height Google Chrome browser window on my personal laptop at the time with a screen resolution of 1366px x 768px. 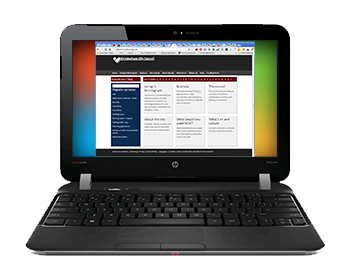 That wasn’t a design requirement – it was a pragmatic decision that since my personal laptop represents a common screen size, and that the design could be made to fit into that screen size, then it might as well have been made to fit into that screen size. But whilst my personal laptop is a common size, it’s by no means the only size I have at my disposal – my work computer was a dual-screen setup at the same 1366 x 768 on one screen plus 1680 x 1050 on the other screen. My desktop computer at home was also a dual screen setup, with one monitor being a huge 1920 x 1080, and the other being a tamer 1440 x 900. My mother, on the other hand, prefers to use her old CRT monitor rather than a modern flat panel screen, with a resolution of 1040 x 768. The screen size issue doesn’t end with the display resolution of users’ screens, though – whilst anecdotally most people I see tend to browse full screen, a sizeable number of people don’t; indeed, the bigger the screen size the less likely people are to browse full screen – so the less predictable it is going to be to say what the optimum height to design for is going to be. But apart from the issue of there being no such thing as the standard screen size, it’s a myth that people don’t scroll. Clearly people scroll, because otherwise they wouldn’t be able to read long articles! And our own statistics for clicks on the home page of our main site show people are just as likely to click on the transport, planning, and rubbish links at the bottom of the page as they are on the lesser-used popular pages at the top. Paddy Donnelly makes the myth of the fold graphically clear on Life, below 600px (warning: in some of his other articles on that site he expresses himself in no uncertain terms). So when we designed the iteration of the home page for the site which we moved to a couple of weeks ago, whilst it was a shame it no longer fitted snugly into my laptop screen, we considered it more important to convey all of the content on the home page we know we want to have on there than trying to constrain everything into an arbitrarily chosen height. And we know that there are enough visual clues on the page to let people know there is more below what they can immediately see when they first load the page. In thinking about the future shapes of our council websites, we all of course understand the need to perform brutally honest ROTE analyses of every single page on our sites, and likewise we’re all geared up for restructuring our websites and the content in them according to properly thought through content strategies. So we know we need to get rid of those pointless pages about stuff the council has nothing to do with such as the history of Birmingham’s canals, or the history and recipe behind Eccles cakes, right? Both of those pages – canals on our own website, and Eccles cakes on the website for Salford City Council, are both in the local history sections of the website, and whilst some people might suggest the responsibility of councils for the curation and dissemination of local history might be tenuous in the modern era, it still does remain a function of many council library services. So you might believe – as actually I did until relatively recently – that whilst this content belongs on the web somewhere such as Wikipedia and could indeed still be maintained by an appropriate member of council staff in council time, since this kind of thing doesn’t represent a part of the core council services we need to promote to the public it doesn’t belong on the main council website. In the last three months, our canals landing page has received 1,528 pageviews out of the total of 9,602,547, or 0.02% of the total. Not massive overall, by any means, but over a period of three months, 500 pageviews a month is still a reasonably sized number, especially when you realise that’s 17 pageviews a day. So why are the pages important? After all, who goes to the council website looking for information about canals and Eccles cakes? If you type ‘Canals in Birmingham‘ into Google you’ll see why instantly – at the time of writing, our canals landing page is the number one result. Similarly, a Google search for ‘Eccles cakes‘ has the Salford page in the still reasonably respectable position of number seven on the results page. In a nutshell, these pages provide our sites as a whole with valuable Google-juice – they’re important items of content relevant to our cities, which a search for information about those subjects leads people to our sites; people who might not otherwise have visited our sites, and people who once they are here, a well-constructed, well-laid-out site with good cross-sell links can remind them that as well as finding a recipe for their favourite morning snack, they can also sort out their council tax, report a pothole, and book a bulky waste collection, and all the other core services we are trying to channel shift them from the telephone to the website to carry out. Not necessarily now whilst they’re still thinking about breakfast, but in the future when they need it. The Presidents of Google-juice are Woodlands Junior School in Kent – they’ve got a separate learning resources site packed with so much information a surprising number of Google searches brings up their site in the top ten, even on content that has no relation to their function as a school – they positively own the front page on a search for ‘British life and culture‘, with the top seven results all pointing to their sites! So returning to the Trivial content in our ROTE analysis, whilst we still need to be vicious in declaring truly trivial content as ready for deletion, before spiking anything out of hand, stop and think – ‘could this content be drawing people to the site through search queries? Could it be improved in any way to better bring people in?’ A page which contains nothing more than a graphic of a poster for a campaign will probably indeed be categorised as trivial to be deleted, as might a page containing no more than a handful of vague facts about the campaign’s topic which have themselves been sourced from a Google search on the grounds of being unlikely to generate inbound traffic from searches – but if the page has something important, relevant, authoritative, and most importantly unique to say on the topic, then the chances are it will still have some value – so long as it requires little by way of ongoing maintenance, and its existence isn’t likely to get in the way of visitors accessing the more important content we know we need to prioritise. An interesting piece which makes for quite a compelling argument. The bit about the Presidents of Google-juice ie. Woodlands Junior School in Kent is more than a little disturbing for what I hope are obvious reasons i.e. if we are all to aim to become “Presidents of Google-juice” what a horrendous picture that could present for the future use of the internet? Nothing wrong with Eccles cakes or Birmingham Canals and I know society generally has and is moving to a ‘one shop for everything’ mentality [which has of course seen so many of our small and medium sized specialist traders go out of business and undermined real competition – another gripe of mine] but everything in it’s rightful place is what I say. So to cut to the chase I think you’ve got it wrong – even though I like eccles cakes myself I couldn’t eat a thousand…………sometimes less really is more! Indeed – and in fact Google themselves are wise to techniques Search Engine Optimisation consultants use to artificially massage content to the top of the list, and regularly change their algorithms as they spot what artificial techniques are in vogue at the time; the key to good SEO remains writing good copy, with the key information packed into the lede paragraph, and proper HTML coding. 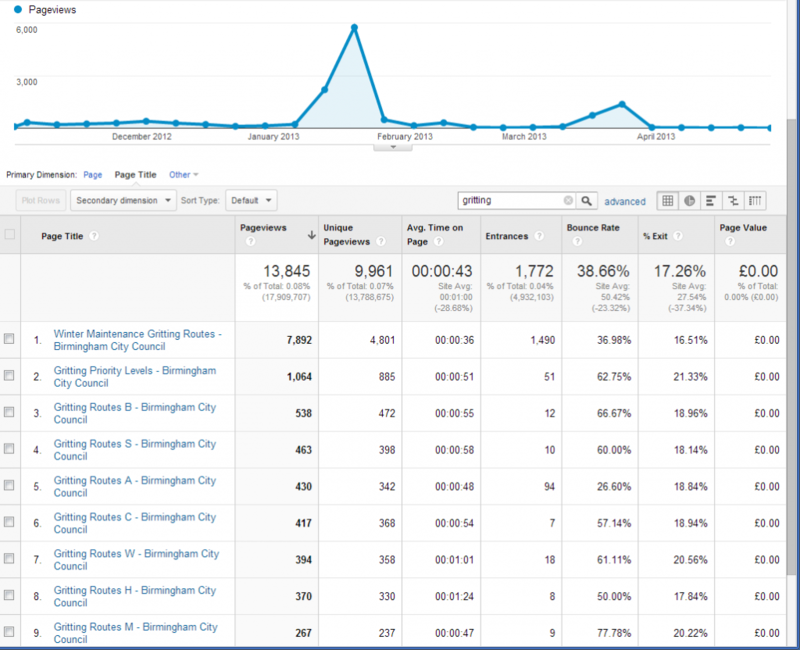 The difference between the Birmingham and Salford cases and the Woodlands case, though, is the niche content we are using and Salford are using is actually relevant – Eccles cakes are relevant to Salford and canals are relevant to Birmingham – so it’s not random content in order to scattergun appearance in unrelated searches, but rather, further enriching the search pool with relevant content. Hm – I think the word “relevant” is critical here, it clearly means one thing to you and another to me? 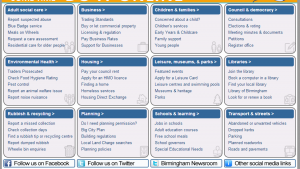 Would you class Aston Villa and Birmingham City Football clubs as relevant to a Birmingham City Council website? and are they more or less relevant than the canals of our great city? It’s all quite subjective really and with the seriously diminishing resources available to ‘the public sector’ my feeling is that lines have to be drawn in the sand. Let’s not forget that creating content is not the end [or even the beginning of the end] but everything has to be reviewed, checked etc. on an ongoing basis…..and with depleted resources hmmm ??? I stand by my eccles cake comment – less is sometimes more. Well, in the context of a section about sport or leisure in Birmingham, if the relevant web editor together with their management structure thought that it would be a good addition to the portfolio of pages about Birmingham’s sport and leisure offering to include information about significant sports teams in the city, then I wouldn’t challenge them – after all, how many people come to the city every weekend to attend their games? Similarly, those football teams, and Warwickshire County Cricket Club, are important aspects of the city’s history, so again I don’t see why historical information about them shouldn’t appear in the local history section of the site if the web editor concerned thought so. I think we do need to be careful about not being parochial in what information we cover – after all, our purpose is to provide information and service to citizens, so if we out of principle restrict our information only to the services we provide ourselves, then we do a disservice to the people relying on us – as an alternative example, if our information about parking in Birmingham is restricted to only council parking spaces, then we might get slightly more revenue from people who consequently don’t go to a NCP car park, but by doing so we’re serving ourselves, not serving our residents and visitors. In some of the other articles about design, one thrust of the comments made has been that a council website shouldn’t just restrict itself to being a portal for people to pay their council tax, report potholes, and complain about their bins not being collected – the council website should also be a showcase for the city itself, reflecting something of what it’s like to (and I loathe this phraseology myself) live, work, and play in the city. Tom Steinberg, founder of MySociety, recently said ‘In five to ten years time, we won’t have council websites – the website will be the council’; and as more services become contracted out or commissioned, surely it would be silly of us to piece by piece remove the information about them from the website? I think another misconception is also being raised – that the more content the site has, the more expensive it is to maintain. Yes indeed, the planning, licensing applications, and planned streetworks weekly lists work out particularly resource-intensive to create, review, and maintain, but the histories of the canals and of Eccles cakes are broadly fixed; no new canals are likely to be built in the next ten years, and no new developments in baking technology are likely to affect the recipe for Eccles cakes – so the pages, once created, need little ongoing maintenance. Similarly a page about the city’s famous sports teams would probably only need updating on the comparatively rare occasions they won a glittering prize! On 11 June 2013, Socitm – the national association of people working in the field of public sector online services – held an event to present their latest findings in the area of how people are using mobile devices to access council websites. The headline fact that was revealed was that during the first five months of 2013, 27% of visits to council websites were from mobile devices – ie, 27% of the people looking at and doing things on council websites were by people using mobile phones and tablets, as opposed to on laptops and desktop computers. Rubbish, leisure, and schools were the top three areas which people were more likely to look at on mobile rather than desktop, with libraries and housing following behind. Transport information, roads and streets, jobs, council tax, and planning also all featured high in the list of services accessed with a mobile device, but at roughly the same proportion as desktop users. The other usual high hitters were on the list as well, but interestingly parking – a service one might have thought particularly appropriate for mobile – had about 4% fewer accesses from mobile devices than from desktops. What the data didn’t explicitly show was what particular schools information people were looking for on their mobiles, but we can infer from the timing that it was mostly people looking for information about school closures during the winter (and early spring) snow events. What the data also doesn’t yet show is the balance between people using mobile phones and people using tablets – this could be quite interesting, because for the most part tablet browsers behave more like desktop browsers rather than phone browsers (which has relevance to page design and content), but the main usage scenarios are different – for example, mobile phones will be most often used out in the mobile arena (on a bus, walking down the street, in the pub or a restaurant, or at work for personal browsing purposes etc), whilst tablets will be most often used at home. But the difference between tablet usage at home and desktop usage is most people with tablets will likely have them in handy locations where they themselves are – eg, on the coffee table by the sofa, or in the kitchen, or on the bedside table, whilst conversely most people’s desktop computers are in a separate room in the house, and even their laptops when not kept in the laptop bag will still need to be turned on before use. The implications of this are that the number of ‘impulse’ website visits are likely to increase as tablet market penetration increases, and we need to be able to meet that demand by being able to offer the richer experience than phones that tablets can provide, whilst still accounting for the fact that even on a retina display iPad 4 you can’t cram as much information on the screen as on a desktop computer with a 21″ monitor. Socitm are going to look at seeing if there are easy ways in which that extra data can be determined. People using mobile devices compared to desktop users are much more likely to be looking for information than wanting to carry out some form of transaction, be that literally paying for something or completing a form to report or book something – on desktops, 55% of visitors are looking for information, 26% want to complete a transaction, and 19% want to do something else, but on mobiles 64% are seeking information compared to 23% wanting to perform a transaction – so whilst it’s right for us to continue to work to ensure transactional pages offer increasingly good customer experiences on mobile devices, we need to never forget the purpose of a website being to provide information to people, especially for mobile users. When one considers it will always be much easier to make a phone call with a mobile phone than to fill in a form on one, this isn’t too surprising. We also learned from one council that people looking at pages about actual physical locations appear quite high in their mobile access statistics. One surprising piece of information we learned is ‘task failures’ (Socitm-speak for people coming to a website and being unable to do or find what they went there for) are only slightly higher on mobile than desktop; unsurprisingly, visitor satisfaction is significantly lower from mobile users than from desktop users – as the localgovweb community, between us we all have a lot more work to do to improve the mobile experience for people. 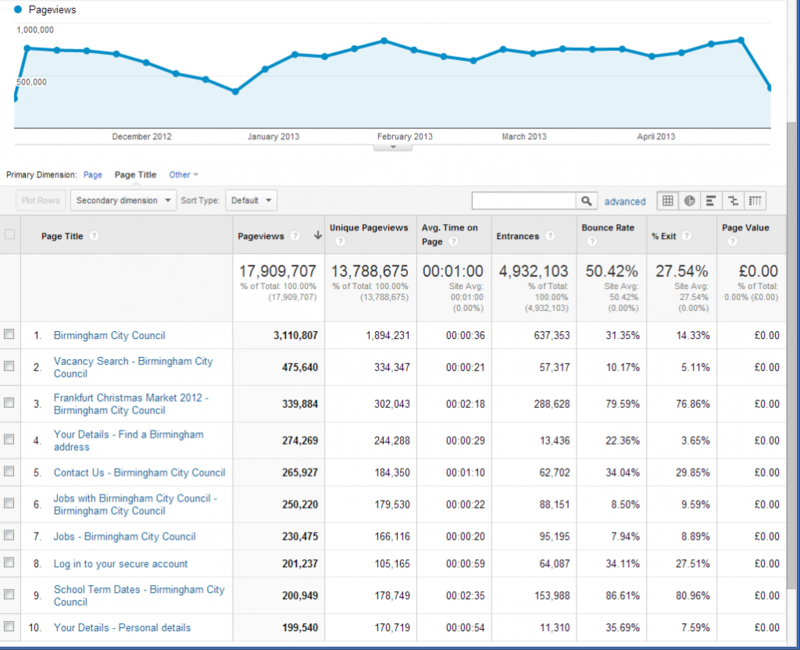 An interesting addendum to the visitor satisfaction statistic is that it has been steadily dropping overall over the last few years, during a period when most councils have been working hard to try to make their websites better for people! Could this be due to the various experiments different councils have been trying in order to break away from the old LGNL navigation paradigm? Could it be due to some councils trying to artificially massage their sites in order to gain favourable results in the annual Better Connected report (against Socitm’s own advice, I might add) to the exclusion of the rest of their content? Or could it be due to the fact that users are simply becoming more sophisticated and expecting more and better from their council websites? In our own case, we know that some of the dissatisfaction logged against our website turns out not to be dissatisfaction with the site, but the service – so for example, there aren’t many jobs on our website, but a large number of people log that in the exit questionnaire as a complaint about the website rather than a complaint about there not being very many jobs at all! Whatever the reason for the drop, it’s a challenge for us again from the wider community to look more closely at the data to put a v in the line and make it rise again. What does this mean for mobile strategy for the future? The first point is there should be no mobile strategy. Or rather, we should not think about mobile strategy in isolation – we need to focus on creating and implementing overall digital strategies, which should encompass mobile strategies as part of that as well as other digital access channels. That might seem to be stating the obvious, but since many councils are still at the early stages of actually strategising their digital presences (as opposed to just getting on with it), it’s a point worth emphasising! We were warned against making too many unwarranted assumptions about people’s mobile usage habits without data to back those assumptions up – for example, we can’t assume that everybody wants to do location-specific things with their mobile devices; we can focus on giving those tasks an especially good mobile experience, but not at the expense of ensuring non-location-specific tasks also give a good mobile experience. As noted above, the middle ground of tablet devices allows for a near-desktop experience with the convenience of doing so on a device which is usually immediately to hand and switched on, at home rather than out and about. And just because people are on the move when using their phones, that doesn’t always mean they’re in a hurry – although if people are physically on the move, any mobile system needs to be able to cope with signal dropout gracefully. We need to be pragmatic about what might be achievable – but we also should be creative in our pragmatism. For example the civically-engaged person walking along the street spotting a planning or licensing application notice on a lamppost might want to log the url for more information on their phone, but it would be unreasonable of them to expect the full experience of being able to open the .pdfs of the detailed drawings and view them on their 4″ screen and post detailed comments back using their phone keyboard. But a creative use of the technology across a wider digital strategy would allow the user to start the process of looking at the planning application on their phone, logging it for future reference, and then being able to easily complete the process later on resuming from where they left off when they get to a desktop computer. 90% of people do indeed use multiple devices to accomplish an online goal, so we need to make that easier for them. We know that 92% of UK adults personally own some form of mobile phone, and 39% of us access the internet on one – 64% of us with smartphones access the internet on it at least once a day. Actual mobile usage patterns depend on a number of factors – demographics, local or national news events, time of day, time of year, even the weather. We especially saw the effect of weather on usage during the snow events, as people found it much easier to check for school closures and other disruption first thing in the morning on their phones than on their computers. And in more isolated communities, power cuts can make mobile the only option – in those instances, people need to get essential information as quickly and easily as possible, so they can conserve their precious battery power. And rather than thinking about hiding content and components in a form from a mobile view, we should think the other way around – is this extra content necessarily relevant for the desktop version? In our own thinking about content strategy we suggest a complete separation of service information from the information about the policy behind the service provision, as can be demonstrated in our recently created suite of pages about bus lane enforcement. So if a paragraph of text looks like needless fluff on the mobile screen, then it’s also needless fluff on the desktop; if it’s content which is secondary to the primary purpose of the page, don’t assume desktop users will be interested in it but mobile users not – separate it out into another page. And finally, as we see the trend move in the direction of mobile access taking over (but – emphatically – never replacing) desktop access, we should turn our thinking about how our page layouts are constructed – rather than planning for graceful degradation of layouts as the user’s screen gets smaller as most mobile-friendly sites are currently built, we instead need to move in the direction of planning and designing for progressive enhancement, starting with the assumption of most users’ screens being 2″ wide in portrait orientation, progressively growing to 21″ landscape – and also along the way accounting for the increase of laptop screens which are wider and shallower than the 16:9 aspect ratio we’ve become accustomed to on desktops. You can see the presentations containing sources for some of the facts quoted on Socitm’s page for the event. When designing a new website, especially when proposing a radically new menu system (‘information architecture‘), it’s important to test with one’s potential users that the design and navigation proposed actually works. There are many pairs of pliers in the usability tester’s toolbox to help them with this – card sorting exercises for navigation, eye tracking studies for layout, unstructured sessions with or without interviews to get a gut feeling for the level of success and/or to look out for potential problems outside the planned testing, and the setting of specific tasks to test participants to establish (a) if they can complete them at all, and (b) how easy it was for them, what their ‘customer journey’ through the site to task completion was. The prevailing wisdom in the Local Government digital community, as pioneered by Socitm, is the Top Tasks Methodology – whereby using your access and search statistics you identify the 10 most frequently accessed tasks on your site, and optimise your home page and search engine optimisation around that. Socitm themselves with their annual Better Connected assessment of council websites expand beyond some of the obvious top tasks by measuring a different selection each year. We deviate slightly from literal tasks in areas such as council tax – whilst a task might be defined as ‘paying your council tax’, we know from our own statistics that a sizeable number of website visitors are also interested in other council tax-related tasks (reporting a change in circumstances, applying for council tax benefit, etc) so it makes sense to lead visitors from the home page to the council tax landing page and let them choose their own task from there. On our proposed interim layout we retain that list of top popular pages on the left of the home page, and the service top tasks are moved to the new segmentation landing pages, and also to megamenus as part of the menu bars on the top row. We’ll clearly need to user test these customer tasks to ensure they’re as obvious to complete as we’d assume they would be. It would be easy to stop there and think job done, safe in the knowledge that we’ve catered for that majority (the notional 80%) of customers who are after that minority (the notional 20%) of the content. But don’t forget, one of the intended outcomes of this project is to ensure that niche content is just as easy to find as majority content, without the presence of both interfering with each other. If we make it incredibly easy to report a missed bin collection, but it’s near impossible for somebody to find information about the city’s Archaeology Strategy (highly niche content, maybe, but essential reading for any organisation planning a multi-million pound building development), or Strategy for Economic Growth (again niche, but important for anybody responsible for allocating multi-millions of pounds of investment funding in the city) then by our own objectives we will have failed. So yes, we’ll be testing user-testing our top tasks to ensure people can complete them – but we’ll be treating these as control groups; if these tests fail then there will be something catastrophic in our interaction design. We will also need to user test the journeys to the niche pages above – and, indeed, we need to ensure that middle ground content – say, school admissions procedures, the noise nuisance report page, and how to make a freedom of information request, is also properly user tested, to ensure those tasks are also easy to complete, and that making those tasks easy to complete doesn’t make it difficult to complete the top tasks. As well as the issue of images on the home page, another issue which has been the subject of a fair amount of internal discussion is the one of marketing campaigns on the home page. Our current site – like almost every other council website in the country – has an area on the home page devoted marketing campaigns, such as where we promote our commercial property portfolio, advice about staying warm in winter, or information about public question time at full council meetings. It’s part of the received wisdom of how a council website is constructed that the council has messages it needs to communicate to the public, and the place for it to communicate those messages is via the home page, because the home page is the most important page of the site, isn’t it? We now challenge that received wisdom. We have a number of evidential reasons to challenge the notion that the best place to market to our audience is via the home page, plus the consideration of what is the established marketing good practice of segmenting your market and targeting your campaign material according to your audience. Clearly, mixing messages about democracy, winter warmth advice for the elderly, and commercial property to let all in the same campaign space flies in the face of that good practice. Looking at the actual statistical evidence, of the 34,400,030 pageviews our main website has had in the last 12 months, only 1,617,239 of them – 4.7% – have been of the home page. Looking at the first page people arrive on the site, you might expect that most people indeed arrive at the site on the home page. Wrong! Of the 9,049,851visits the site has received in the last 12 months, only 1,098,829 of them, or 12%, have arrived at the site via the home page. The majority of our site visitors – 68.37% of them – arrived arrived at the site via a search engine. 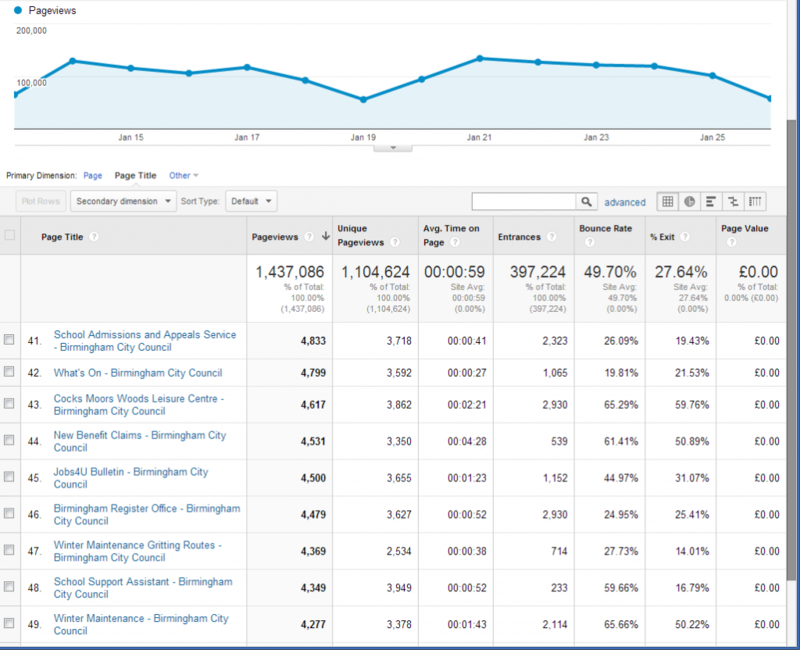 18.24% were via referrals, and only 13.38% were ‘direct’ traffic, and of the direct traffic only 273,501 of the visits were of people actually typing www.birmingham.gov.uk into their browser bar; the overwhelming majority of visitors typed keywords relating to the service they required into Google, which took them straight to the information they were looking for bypassing the home page entirely. During that three month period, the home page itself received 380,378 pageviews; removing the anomoly of the Bulletin campaign has an average pageviews for the campaigns of 420, giving a maximum potential clickthrough rate for those campaigns of 0.001262, or 0.1%. Clearly from a marketing perspective, marketing via the home page is a sub-optimal strategy. Our proposed alternative is to shift the campaign boxes from the home page to each segment landing page – so campaigns of interest to residents will be on the residents landing page, campaigns for business on the business landing page, etc, and further use the right hand sidebar of the the pages to deliver other more focussed and targeted campaign material direct to the customers who need it. This way, we believe everybody will win – customers will see the campaigns which are relevant to them, and service areas will be sure their campaigns are going to the relevant audiences.